Teeny-Weeny Bear (p. 81) requires beginner sewing skills (although the tiny nature of the project might be a little challenging to a novice sewer). Students will take away a miniature felt teddy bear (or two). This novelty item can be turned into a brooch, a set of earrings, or even a magnet. Teeny-Weeny Bear is rather cute! And here's an idea: why not decorate an empty matchbox and turn it into a bed for Teeny-Weeny? Children will love to play with this toy. This project should take about one hour to complete. If students are fast sewers, they should be able to make more than one teddy. Refer to p. 81-84 of Pipsqueaks - Itsy-Bitsy Felt Creations to Stitch & Love by Sally Dixon. 1. Transfer the pattern pieces onto paper. 2. Cut out the patterns pieces in chosen felt colors. 3. Sew and embroider teddy-bear face. 5. 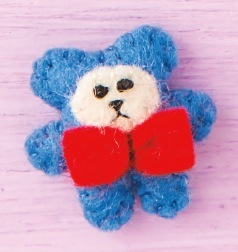 If creating a brooch, attach the brooch pin (or safety pin) to the back of the bear. 6. Blanket stitch around the teddy pieces and stuff. 7. If creating earrings, attach the earring findings at this stage. 8. If creating a magnet, glue the magnet to the back of the completed teddy. Mister Mousy (p. 63) requires beginner sewing skills (although the tiny nature of the project might be a little challenging to a novice sewer). Students will take away a miniature felt mouse. 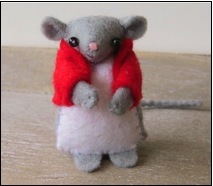 And here's an idea: why not create some miniature accessories for Mister Mousy to hold and play with? He might like a cupcake (p. 76); strawberry (p. 85); pet doggy (p. 88); or ice-cream cone (p. 92). Mister Mousy can easily become a Miss Mousy with the addition of embroidered eyelashes or a fragment of felt around the jacket collar. This project should take 2–3 hours to complete. If students are fast sewers, they should be able to make more mice, accessories, or begin a new project. Refer to pp. 63–70 of Pipsqueaks—Itsy-Bitsy Felt Creations to Stich & Love by Sally Dixon. 1. Transfer the pattern pieces onto tracing paper. 2. Cut out the pattern pieces in chosen felt colors. 3. Sew tail and paws according to the instructions. 4. Create mouse head according to instructions. 5. Stitch mouse body according to instructions, inserting tail and paws when appropriate. Stuff. Attach head. 6. Stitch mouse jacket according to instructions. Attach jacket to mouse. 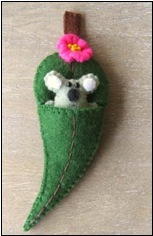 Koala in a Gum Leaf Bed (p. 53) requires beginner sewing skills (although the tiny nature of the project might be a little challenging to a novice sewer). Students will take away a miniature felt koala and gum leaf. And here's an idea: why not attach a magnet to the gum leaf to make a novelty fridge magnet? This project should take 2–3 hours to complete. If students are fast sewers, they should be able to make more koalas or begin a new project. Optional supplies:Tracing paper and transfer pen, or a photocopy of the pattern. Refer to pp. 53–57 of Pipsqueaks—Itsy-Bitsy Felt Creations to Stich & Love by Sally Dixon. 3. Sew and embroider koala face, ears, and tummy. 4. Blanket stitch around the koala, and stuff. 5. Stitch detail onto gum leaf and stitch the stem. 6. Blanket stitch around the gum leaf. 7. Prepare blossom. Attach to gum leaf with beads.